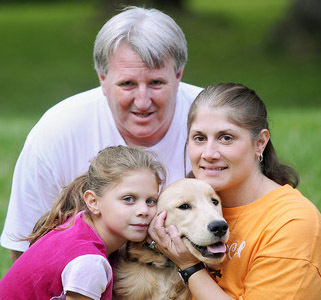 Riley, with Brian and Mary Ann Reynolds and daughter Briana Carilli. After allegedly kicking her ex-husband’s six month old dog with both feet, Cassandra Reynolds was ordered to have no contact with the Golden Retriever, Riley. The judge issued the order of protection under Connecticut’s new law called “An Act Concerning the Protection of Pets in Domestic Violence Cases”. Pets are often victims in domestic abuse cases. Abusers use threats against pets to control their human victims. And abusers follow through with those threats to punish their humans victims. Agencies across the U.S. are realizing domestic violence, child abuse, and animal cruelty are often closely linked and where there is one form of violence, there may well be the others. Police, homeless shelters, and animal control services are learning to recognize and respond to the signs of animal cruelty, domestic violence, and child abuse. Read more about the studies mentioned in the New York Times article—The Abuse of Animals & Domestic Violence: A National Survey of Shelter for Women Who Are Battered and Animal Welfare & Domestic Violence. Learn more about what can be done for victims of domestic violence who fear for their pets from the book Safe Haven For Pets: Guidelines for Programs Sheltering Pets for Women Who Are Battered(pdf), by Frank R. Ascione, Ph.D. Check if your community’s shelters and animal welfare agencies are cooperating to help victims of domestic violence and their pets. What a sad thing to abuse and hurt an innocent defenseless animal out of anger or frustration. It is wonderful that CT law recognizes and protects animals from these cowardly acts of abuse. Kudos to authoritites and judges for recognizing and responding to this CRIME! !